By Raleigh-Elizabeth. Image by the incredibly talented Ellie of Dearly Loved Photography. Ellie is a family photographer, so if you’re in the Atlanta area, be sure to check her out. I love cheese. I know we’ve established this so many times it comes as no surprise, but maybe that I’m writing about it at the same time that I’m writing about wedding cakes should. After all, as much as I love cheese, I love cake. I eat it for breakfast, lunch, and dessert. (I consume vast amounts of vegetables at dinner in an attempt to make up for this cake indulgence. But cake is delicious!) Cake, from its hearty breakfast forms to its most delicate, intricate dessert styles, is a wonderful reason to eat. But wedding cakes get a bad rap. First of all, they are zillions of dollars. (Everyone remember Steve Martin in Father of Bride upon seeing the hefty price tag of the cake? “A cake, Franc, is made of flour and water.”) Secondly, they really are made of flour and water. And almond and buttercream and raspberry filling and eight layers and covered in sugared lilacs and edible pearls and who could forget the fondant and… well, the cake just about gets lost in there. Cheese, the world’s most perfect food, is terrific as appetizer, meal, and dessert. 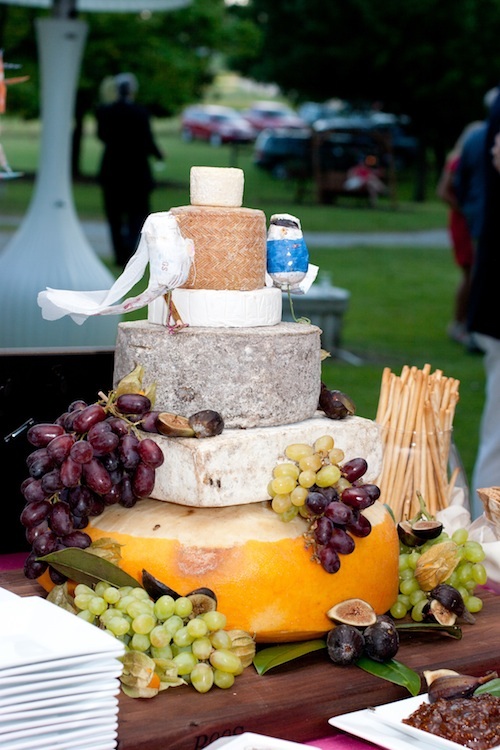 Which is why we had it at our wedding, layered, stacked, and towering… in cake form: Rounds of crottin, petit basque, brie, Thomasville tomme, Appalachian Tomme, and San Joaquin Gold piled high. It was overwhelmingly delicious and I remain grateful to the good people at our caterer for not rolling their eyes at me and sending me elsewhere upon hearing my request (especially since I also requested that we ditch a sit-down meal in favor of a passed cocktail supper). Instead they indulged us and created a monument to all things cheesy one could ever want to consume, and with it were fig spreads, grissini, honeycomb, and crackers galore. We served it at the beginning of the meal, when we toasted our guests (we did everything sort of backwards. We skipped the traditional toasts in favor of us toasting everyone else, and then we served the cake first! ), and it was really fun, delicious way to kick off the evening. My mouth waters just thinking about it. But my mouth waters for other unconventional wedding cake ideas, too. A good friend had a candy bar (it had lots of swedish fish and was therefore perfect) that doubled as a favor-station. Another served beloved family-recipe cookies made by aunts and grandmothers the day before so they were still fresh. My sister-in-law served donuts! Nowadays even the old-fashioned wedding cakes come in a hundred varieties. Charm City Cake in Baltimore makes a spiced pear cake to die for, and the blackberry sour cream sounds pretty phenomenal too. Add in swiss butter cream and a sentimental cake topper, and I think that’s a pretty sweet start to ever-after. Not that a savory start is so bad, either. Tell me: What kind of wedding cake did you have? Or dream of having? If you were to do it again, would you do the same thing? I have to admit, I think I would want to skip the reception in general and have a tamaledad instead! Our wedding cake (from earlier this summer) wasn’t too expensive, but I slightly regret going the traditional wedding cake route… You can see a picture of it here: http://www.annabelvita.com/2013/09/02/the-wedding-a-bridesmaids-view. Barely any of it got eaten and I think a home made one would have gone down just as well with the guests who did have some! As far as wedding regrets go, it’s a minor one and we weren’t out that much cash over it really. Ah! That’s outrageous! That’s part of why we served it first… but man. At least everything’s good among friends. And your cake was beautiful! Traditional Swedish Smörgåstårta. It’s basically a layered cake-sandwich…or sandwich-cake…not sure what the primary category is… But, anyway, its layeredness made it a perfect (savoury) wedding cake, and it was certainly unusual. And tasty. I just had to google that. But it looks delicious! Sandwich cake. Cake sandwich. Cakewich Delicious. Oh my gosh, if I could redo our wedding, I’d have a cheese cake. This is one of the best ideas I’ve ever heard! I do love regular cake though and we had two small cakes at our wedding, both because I couldn’t decide on just one flavor, and because I think smaller cakes are way cuter than huge ones. smaller cakes ARE way cute. We bought a few carrot cakes from Flour Bakery (in Boston). I love carrot cake, and Flour makes the best carrot cake I’ve had, and they were incredibly lovely to work with, and it was all very easy and straightforward, and now I have an excuse to stop at Flour and have carrot cake whenever I’m in Boston (to appropriately honor my wedding and marriage, obviously). Flour also has delicious lamb sandwiches. And delicious coffee. And delicious oatmeal. And… okay. Flour is just delicious. We had a delicious, moist vanilla bean 3 layer cake sandwiched with red raspberry filling and covered in vanilla buttercream. It was homemade by a friend and very yummy! If I could re-do, though I’d make the main cake smaller and have some sort of chocolate/peanut butter dessert also (cupcakes? brownies?). We had tons of cheesecakes stacked at different heights and our wedding venue and florist did an AMAZING job decorating it. Guests got to choose fudge or raspberry sauce (or both) on top. It was a huge, huge hit. People seriously still talk about it, 12 years later ;). Oh, and I am totally stealing your cake of cheeses idea for my next big party. LOVE it!! We had a carrot cake with cream cheese frosting, made by my childhood neighbor who happened to own the german bakery in town. Since the layers were heavy, it wasn’t a big cake, and we had extra layers in the back to serve. Not a piece left. So good, and not too sweet. It was simply iced with some piping on the edge, and our florist arranged some fresh flowers on it. I still can’t believe it was 19 years ago, yesterday! i had a pie bar at my wedding. we had about 10 different types guests could choose from. A dear friend of mine offered to make the cake–lighly-flavored lemon with lemon curd and vanilla buttercream made with homemade butter! It was a wonderful gift. She also made a gorgeous red velvet groom’s cake. We did not save our top layer for our anniversary, but chose to share it with our parents and siblings the next day as we opened our gifts. And we’ve continued that tradition with our four kids; we always eat birthday cake for breakfast the morning after a party. I’m not that much of a cake person, so I always thought I’d have pies for my hypothetical wedding – I love pie. But a cake of cheese sounds even better! *GASP* Now that is my kind of wedding cake! I’d MUCH rather have cheese instead of cake. My brother and sister-in-law requested two cakes (one for each of them) for their wedding celebration. Using old family recipes, I made German chocolate with coconut/pecan frosting for my brother, and carrot cake with cream cheese frosting for my sis-in-law. I loved the non-traditional look of these two cakes at their reception. my daughter can only have limited amounts of sugar and her favorite dessert is pecan pie so her sister made her a pecan pie in a cake pan for her “wedding cake”. It was beautiful and delicious. We had amazing desserts from our caterer, so I didn’t care about having a fancy cake. Mostly I wanted it just for the tradition of cutting the cake. A friend of my MIL’s was just starting a cake business and all I wanted was something simple. (2 layers with white frosting & purple ribbon.) She said she would do it for $30! I didn’t expect it to be much, but it ended up being SOO good. My mom decorated it with flowers leftover from flower arrangements, and I couldn’t believe how good it looked! Such a pleasant surprise to have something I expected to not care about be such a highlight. We served gelato. The company set up a cold case in the corner and staffed it. Guests lined up and picked up to three flavors. The mots popular, by far, was “Panna Cotta Wedding Cake.” It tasted exactly like cake. My husband and I didn’t cut anything but we fed each other a spoonful from a fancy gelato sundae for pictures. Plus my best friend is vegan so one of the choices was a berry sorbet. It was a hit! We had a three-tiered Rice Krispies cake. Neither my husband or I are particularly fond of cake, but we looove Rice Krispies. It was a tad difficult to cut, but there’s a great picture of me making a face trying to cut it. We also had a dessert spread for people who wanted something else. I thought the wedding cake would be one of the easier tasks – but planning from a different country made this simple task very hard. I went for three flavours – chocolate, lemon and carrot (as you can tell I love cake too). My husband does not like sweets (I know – what is WRONG with him? :D ) so we opted for a spice cake with minimal “frouf” and simple buttercream frosting. But to put our own special touch on it – our cake topper was a small bowl with 2 live goldfish. It was a nice fun touch to an otherwise rather traditional wedding, and one our friends still talk about 10+ years later. I had.a Neapolitan polka dot cake and I wouldn’t change it for the world. It cost more than my dress and every bite was worth it. We both don’t really like cake, so we had an ice cream bar instead. The only bummer was that, unknown to us, the caterers insisted on serving us , and they brought everything to us–but not the ice cream. We never did get any of it! Neither of us liked the cut the cake part of the wedding, so that part was also easy to ditch. Also, I absolutely love your cake made of cheese! Delicious! How creative (and delicious)! A cheese “cake!” I, however, have too much of a love for pastries to skip the cake all together. My husband and I had a small (12″ diameter for the large bottom tier) two tier carrot cake because, a. it’s delicious and, b. we wanted to have the traditional cake-cutting moment. But! Being an August wedding, we also wanted PIE. So, we had about 10 delicious pies of all different gorgeous summer fruit flavors in addition to the tiny cake. It was perfect! It is nice to see such a delicious cake. I like chocolate cake but my wife likes pineapple flavour. So we will try it with some alteration. Thank a lot for such a good idea. Ours was pretty straightforward vanilla pound cake with lemon curd and buttercream but we had it decorated in a yellow and white Wedgewood pottery style (yellow background and white decoration. This was before the fondant craze so it was all buttercream and really tasty. We put the top layer in the fridge at our honeymoon B&B and had it for dessert every evening.